Save the Samara Factory Kitchen! 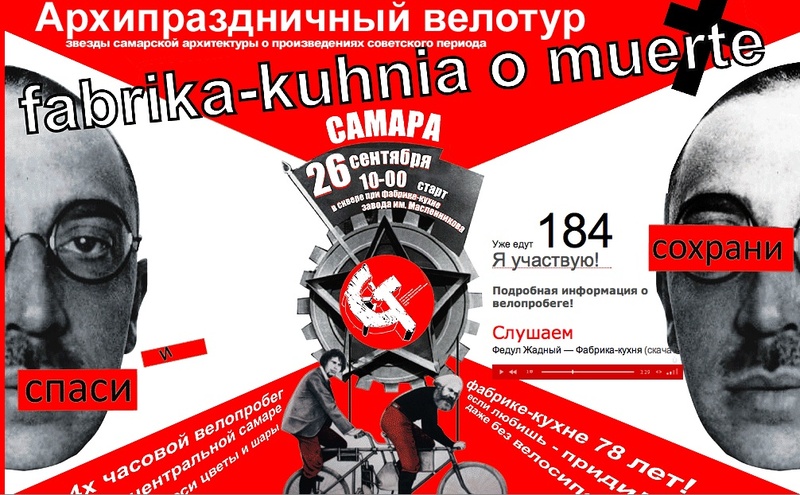 Cyclists will ride around a canteen in the shape of a hammer and sickle Sunday as they try to halt developers from knocking the building down in the Volga city of Samara. The Maslennikov factory canteen, otherwise known as the Fabrika Kukhnya or Factory Kitchen, was built in the early 1930s and remained in use till the early 1990s. 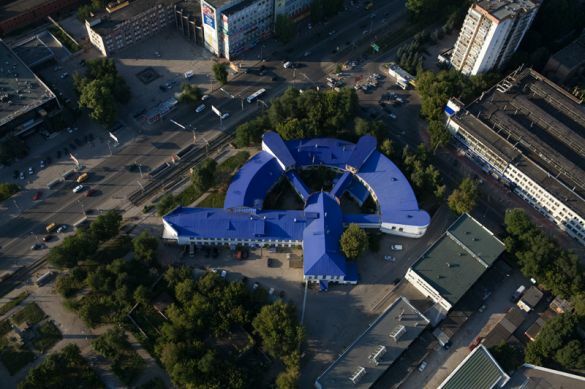 It had three conveyor belts in the hammer part of the building that delivered cooked food to the sickle-shaped canteen. The canteen produced 9,000 meals per day, but it now stands empty. It remains a treasured building of Soviet avant-garde architecture and a symbol of Samara, said the event’s organizer, Vitaly Stadnikov. Stadnikov, who is traveling from Moscow for the event, called on any architecture lovers to come and join the “Veloden,” or “Bike Day,” which will go on to take in the sights and sounds in one of the country’s most architecturally eclectic cities, taking in art nouveau to constructivism to 19th-century traditional wooden buildings. The canteen’s former owner reversed plans to knock the building down two years ago after an outcry in local and foreign media, but officials from the current owners, Samarsky Passazh, said in July that they would knock it down and replace it with a 30-story shopping complex. The campaign has even inspired a techno song with the lyrics, “Factory Kitchen, you are everything,” by local singer Fedun Chyorny. It’s available for download on the “Veloden” web site. Local preservation campaigners say any demolition would be illegal because the site is on a list of buildings that are pending landmark status. It has been on the list for 17 years. Past experience in Samara, a city that has lost hundreds of historical buildings in recent years, makes campaigners fear the kitchen factory will be demolished even if that is illegal. Campaigners have sent a letter to President Dmitry Medvedev asking him to intervene and give the building official landmark status. Editor’s Note. At the Veloden web site you can download a .pdf of the 262-page Samara: Guide to Modern Architecture, a lavishly produced book in Russian and English that should be essential reading for all students of modernist architecture. It will also give you a good idea of what the cyclists will be fighting to preserve this Sunday.